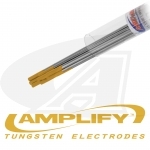 We assembled the best tungsten electrode products from the world's leading brands, Amplify™, CK Worldwide®, Diamond Ground Products®, Huntingdon Fusion, Weldcraft® and Wolfram®. 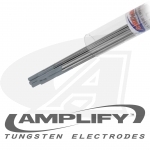 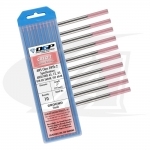 Ultra high-quality tungsten welding electrodes that deliver crisp, snappy arc starts with high current density for improved tip life and weld puddle control. 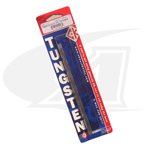 All tungsten products are manufactured to ANSI / AWS A5.12, DIN EN 26848 and ISO 6848 standards. Traditional: 2% (Red Tip™) & 4% Thoriated (Orange Tip™), 1.5% (Gold Tip™) & 2% Lanthanated (Dark Blue Tip™), 2% Ceriated (Grey Tip™ (formerly orange), Zirconiated (Brown Tip™), Pure Tungsten (Green Tip™). 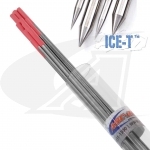 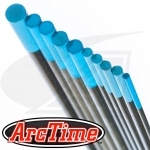 State-of-the-Art: Ice-T & Cryo-T, Cryogenic Treated (2% Thoriated) (Pink Tip™), ArcTime™ (Sky Blue Tip™) & Tri-Mix (Cream Tip™) Rare Earth Oxides Scientifically Blended Hybrid (Non-Radioactive). Use the Request Button Below to submit your Custom Pre-Ground Tungsten Requirements & we will follow up promptly with a quote. 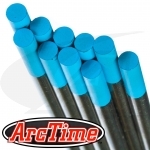 Arc-Zone fabricates & delivers high-quality CNC precision diamond ground electrode services for critical manufacturing applications. 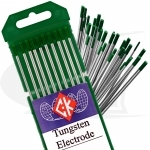 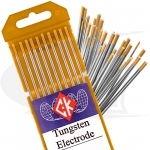 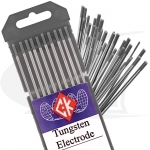 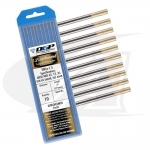 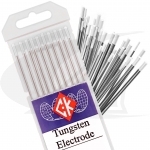 What Makes a Quality Tungsten Electrode? 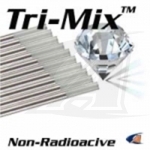 4.5 out of 5 stars (29 reviews).